Filled under: Android Apps, Awesome Tricks ! 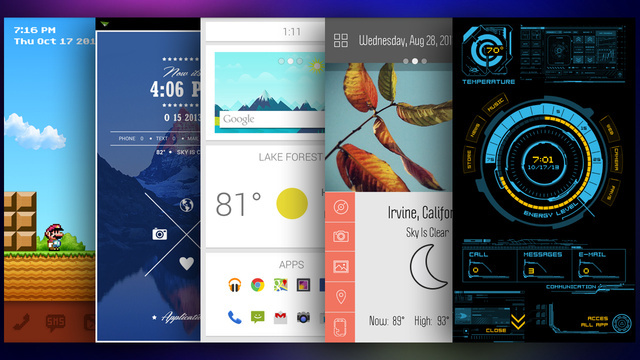 Awesome apps that can change your old boring Android Interface. You have often wondered ,how you want to change your old android interface. If you are bored of your old interface,check out the new apps that can change the look,experience on your device. One of the recent launching app for android,its really a primarily launcher which replaces your default Android launcher app.It gives a lot new experience in its new pattern of home screens ,folders,notification bars and drawers.Its totally different from the default UI. The Aviate has a complete different approach, it keeps changing according to your usage (as well as your location and time during a day). Suppose you are travelling,this app can suggest you the music that suits for the location, the navigation apps and even foursquare(app which can tell you where you can go out to meet friends at the moment).The interesting feature of this app is that the launcher keeps learning as your usage increases which is really interesting.As we all know ,nothing is perfect, minor bugs have been detected which are needed to be cleared by the developers.Well you won't find any serious issues like crashes or lags. Aviate is available on Google playstore. To download Aviate click on the link below. Well this one is really cool in its layout, homescreen(which are customizable).This is same as Aviate which is launcher app for the default android launcher. Themer is developed by MyColorScreen .Well this one is the one of the best app if wish to create(more specifically transform) your Android Smartphone's looks,layouts.Currently there are more than 55000 unique homescreens at themers for you to download(depends on the specification of the device).At first , you may find difficult in managing the layouts and designs as every design and layout differ from one another,but if you starts understanding it,it is the best,amazing ,cool UI you can get. Well this app is working for all android 4.1 smartphones(not sure about working in tablets,as it still in developing for big screens). 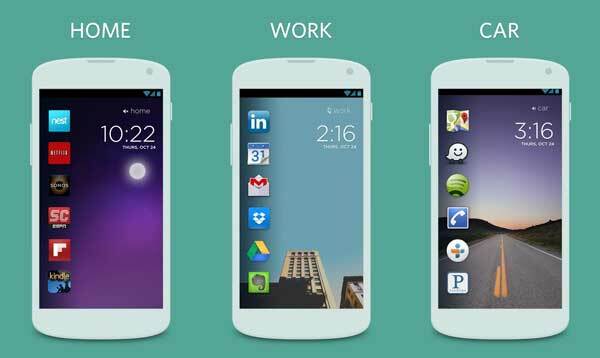 Themer is available on Google playstore. To download Themer click on the link below. GO launcher EX is available on Google playstore. To download GO Launcher EX click on the link below. Its just like Aviate, the app learns according to your usage and keeps updated with your location and the time of the day. Well it seems it is made for screen lock app if you use Android device(more specifically smartphones).The latest and most recently used apps are placed at the top in a clean looking screen. This launcher is good ,user friendly.This app is handy in checking the updates and needed downloads. Cover is available on Google store.But in some regions ,it may not. To download Cover click on the link below. MIUI MiHome Launcher is one of the most easy to use apps as it initially changes the looks of layout of your Android interface rather than completely replacing the design pattern.Another feature is it has its own lock screen, its own wallpaper ,icons and widgets.This app is developed by Xiaomi, a chinese smartphone and app maker.The launcher app can be used in Android devices using 2.3 and above. Many variety of customizable themes are available at Xiaomi's store. MIUI MiHome Launcher is available on Google playstore. To download MIUI MiHome Launcher click on the link below.